ROME (CNS) — Citing health concerns, the head of the Legionaries of Christ handed over his governing powers to the order’s second highest official for an indefinite period of time. Legionary Father Alvaro Corcuera made the announcement in an Oct. 9 letter posted on the congregation’s website. “I do not have the health and energy necessary to face responsibly the demands of the general governance in the present time,” said Father Corcuera, who succeeded the late Father Marcial Maciel Degollado as general director of the order and its lay movement, Regnum Christi, in 2005. The Vatican is currently leading a reform and reorganization of the Legionaries in the wake of revelations that Father Maciel, who died in 2008, had fathered children and sexually abused seminarians. Maciel founded the Legionaries in his native Mexico in 1941. Cardinal Velasio De Paolis, the papal delegate who oversees the order, said in a letter dated Oct. 10 that he had invited Father Corcuera to take “a sabbatical year” out of concern that “a climate” frequently marked by “suffering and misunderstanding” over the Vatican reform might harm the leader’s health. “This is not a resignation from his position nor are we designating a new, substitute general director,” the cardinal said. The priest will retain the title of general director, but he “ceases to exercise its functions until the next general chapter is convened” in either late 2013 or early 2014, the cardinal wrote. Cardinal De Paolis said Legionary Father Sylvester Heereman, 37, a German who has been vicar general of the order since February, will be acting general director until the order’s next general chapter. Almost all of the general director’s decisions still require the papal delegate’s approval. Cardinal De Paolis said the current 12-year term of general director “is too long” and will be reviewed during the next chapter meeting. The meeting will also see the election of new superiors for the order and a vote on the order’s new constitution, which is still in the process of revision, he added. “We look forward to the day when he is fully recovered and takes up once more the governance of the Legion and his responsibilities in Regnum Christi,” the cardinal said. Father Heereman entered the novitiate in Germany in 1994 and made his perpetual profession in 1999. 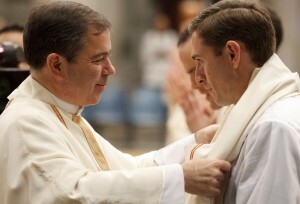 He served as territorial secretary for the Legionaries in Italy from 2001 to 2003, and helped lead the formation program at the order’s Rome seminary between 2004 and 2006. Father Heereman was ordained a priest in 2006 — the same year Pope Benedict barred Father Maciel from publicly exercising his priestly ministry, and required him to live a life of prayer and penitence. The Vatican had investigated claims of abuse made by former Legionary seminarians against Father Maciel but did not try him under canon law because, the Vatican said, of his advanced age and poor health.